This museum is probably as dull and as bland as the review of it, with a general lack of content, lots of cheap displays, lack of depth, and a narrow focus. The coverage of the galleries is limited, showcasing only Cheng Ho and the Arabian Dwoh. The collection is also small, with a few salvaged pieces of the shipwrecked Dowh, while the rest of the collection is being thrown back and forth between the Smithsonian and the academics. Perhaps it should be renamed the Cheng Ho and Jewel of Muscat museum? The preshow is decently uninteresting, with limited CGI, and some nice animatronics. Furthermore, the entire preshow is in Chinese. It is also just a show about Cheng Ho, and not about maritime in general. The CGI there looks uncomfortably old and stiff, with rough renderings and unnatural colors and shades. The Cheng Ho gallery is also small, short and uninteresting. On display for each port of call are small items found there, a small collage of pictures, and nothing else. Even the interactive stations are childish, limited and boring. Of course, the museum is an architectural gem, with soaring arches and high ceilings, as well as huge panels of glass walls that lets light in. 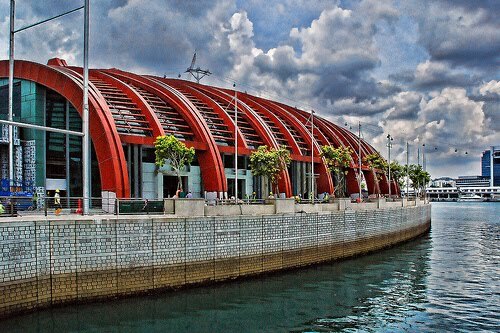 It is also a welcomed escape from the heat of Singapore, and the $5 dollar basic entry fee is reasonable for the quality of the exhibits. This museum leaves guests wondering - Did they run out of budget, or do they only care for the casino? The Maritime museum, or Maritime Experiential Museum and Aquarium, MEMA, is located in Resorts World Sentosa, on the other side of the Bull Ring from Universal Studios Singapore. The museum sits on the water's edge, and is shaped like an overturned hull of a ship. The museum is huge. It is basically one gigantic exhibition space, without divisions, partitions etc. The total height is also huge, about 4 to 5 stories high. 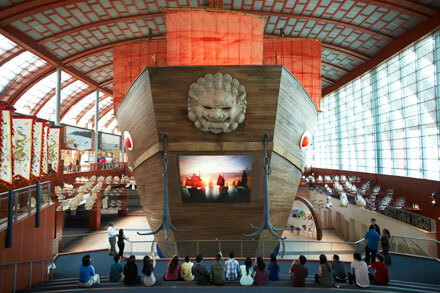 Upon entering, you are greeted by Cheng Ho's Bao Chuan, a giant replica of the treasure ship that Admiral Cheng Ho sailed in back in the 14th century. This is the location for the preshow to the museum. The Bao Chuan's stern comes to life and an animated video appears on the ship. The creature head on the boat also comes to life, with its eyes glowing and its mouth emitting smoke. The content of the preshow is about Cheng Ho's journey, the cause and the impact of the journey that he undertook. 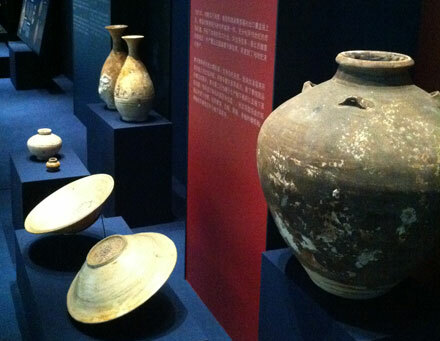 The first gallery is the Cheng Ho gallery, showcasing the unique cultures and items from the different ports of call that he visited. The gallery is highly interactive, with touchscreens as well as real physical exhibits that guests are encouraged to touch and experience. 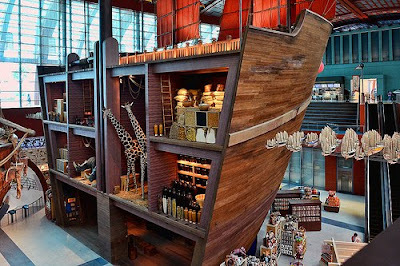 The end of this gallery leads into the Jewel of Muscat, an Arabian dhow that was recreated using ancient handicraft techniques and presented to Singapore as a gift from Omen. It hangs in the gallery, and guests are able to see both the top and the bottom of the boat. The original is still lying in the ocean of Indonesia, and is named the Belitung shipwreck. Artifacts from this ship will be presented in the later galleries. This section leads into the theater, where a wrap-around presentation simulating the sinking of a ship in the oceans shown. The theater was not in operation at the time of my visit, hence I can only say that much. The theater opens up to the lower level of the museum, where guests are channeled into an aquarium setting, complete with life fishes and reefs. This section will only open in 2012. 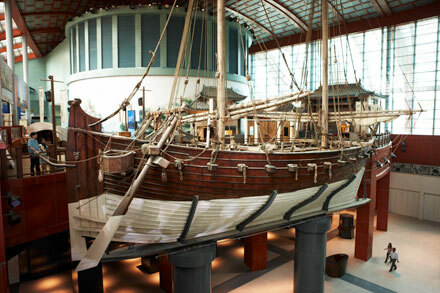 The aquarium leads into the maritime salvage gallery, where artifacts from the Belitung shipwreck are housed. These includes porcelain pieces, gold and silver coins and so on. The recreated Jewel of Muscat, the original which carried these artifacts, hangs above this gallery. This section funnels into a cut through display of Cheng Ho's ship, which offers guests a glimpse into the cargo that Cheng Ho collected in his journeys, which includes giraffes from Africa, wine from many countries, spices and so on. The museum then ends off rather unceremoniously with a small interactive station that allows guests to deconstruct songs heard along the silk road to the basic instrumental melodies, and to play these songs with instruments from different cultures. The final section of the museum is of course, the gift shop, which sells lots of unrelated, unthemed merchandize, that includes soft toys, generic Singapore merchandize, as well as a popcorn stand.